Work is underway at Birmingham on various aspects of galaxies, including the X-ray properties of spiral and elliptical galaxies, colour-magnitude relations, star formation properties and ages of galaxies in a range of environments, and the study of starburst, merging and post-merger galaxies. 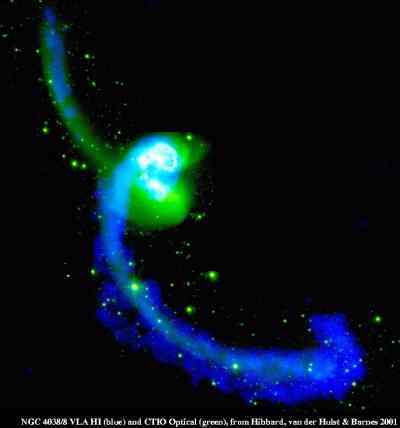 The Antennae is composed of stars (green in the image above), gas (blue) and dust, in a way which has been well reproduced by computer simulations. Observations at many wavelengths show that stars are forming actively within the two galaxies, triggered by the interaction, and also along the interface between the two discs. In the X-ray, large bubbles of hot gas are seen escaping from the galaxy to the south (further information is available on our merging galaxies page. Elliptical galaxies are ellipsoidal stellar entities, supported more by random star motion than by orderly rotational motion. 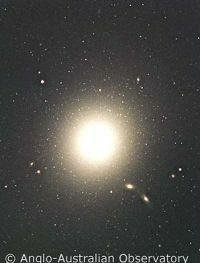 The classical picture of elliptical galaxies is one where the majority of their stars are old (>~ 8 Gyr), they have little dust and gas left between the stars, which allows for no on-going star formation activity, and they are broadly featureless, showing, for example, no spiral structure. However, recent studies of elliptical galaxies, using data collected from state-of-the-art telescopes, show that these galaxies are far from being the old, dead, uniform structures they were once believed to be. We see hot gas in X-rays, dust features and ionised gas in carefully-examined optical features, molecular gas in radio observations, and evidence of recent star formation. In addition to stars, elliptical galaxies have a complex, multi-phase interstellar medium (ISM), which is very important in the context of reconstructing the evolutionary history of galaxies. In some elliptical galaxies, we see evidence of stellar shells, tails and kinematically distinct cores, suggestive of violent interactions in the galaxy's past. The majority of bright elliptical galaxies are found in groups and the cores of galaxy clusters. They represent a greater fraction of the galaxy population in rich galaxy systems with high local galaxy densities than in the poor systems. This is the now well-known morphology-density relation. NGC 1275: The image NGC 1275 taken by the Wide Field and Planetary Camera 2 (WFPC2) of the Hubble Space Telescope (HST). NGC 1275 lies at the centre of the Perseus Cluster, and is one of the most peculiar galaxies in the sky. It may have undergone a merger in the recent past, which could explain the strong dust lanes. Protoglobular clusters may have formed from the gas in the merger, which can seen as the numerous compact bright sources surrounding the galaxy. It is also a strong X-ray and radio emitter. Stellar populations in early-type galaxies 1: we have a powerful technique which allows us to disentangle multiple stellar population components in elliptical galaxies, using spectroscopy and the latest stellar population models. This allows us to identify all the major episodes of star formation in these galaxies, giving us the ages, chemical content, and mass fractions of the dominant populations. We are using this technique on a large sample of near-by early-type galaxies (the Local Early-type Galaxy Study, LEGS), which includes galaxies in cluster environments, as well as less-studied group and field environments. This, in conjunction with multi-wavelength data (X-ray, ultraviolet, optical photometry, radio) and cosmological models, will give us a detailed picture of of the physical histories of these galaxies. Stellar populations in early-type galaxies 2: in addition to the more detailed, individual approach described above, we are also exploiting the huge, homogeneous data set of the Sloan Digital Sky Survey (SDSS). In collaboration with co-workers in the Computer Science Department, we have developed a powerful algorithm (Algorithms) which can rapidly and robustly identify early-type galaxies containing young stellar populations from their SDSS spectra. This allows us to constrain the mechanisms via which elliptical galaxies form, by investigating the environments in which they do so. We find that the majority of present-day elliptical galaxies were most likely formed by major galaxy-galaxy mergers/interactions (Galaxy Mergers). Fossil Groups - These are massive ellipticals embedded in extensive hot gas halos, believe to result from the merger of galaxies in compact groups. We are currently studying the stellar properties of elliptical galaxies in fossil groups. X-ray structure of ellipticals: the hot gas envelopes of elliptical galaxies provide a probe of their chemical and thermal history. We have studied the properties of this gas in a sample of galaxies with ROSAT data, and now have new and forthcoming observations with XMM-Newton and Chandra. One of the issues to be addressed is that of the differences in chemical and thermal history between the brightest galaxy in a group or cluster and its satellites. Page written by Louisa Nolan and last updated 28 Nov 2007. The star formation histories, masses, and morphologies of galaxies are well known to be strongly dependent on their environment, with massive, passively evolving spheroids dominating cluster cores, while in field regions, galaxies are typically low-mass, star-forming, and disk-dominated. These correlations between galaxy properties and their local environment have been quantified through the classic morphology-density and SF-density relations. However, despite much effort, it still remains unclear whether these environmental trends are: (i) the direct result of the initial conditions in which the galaxy forms, whereby massive galaxies preferentially form earlier in the highest overdensities in the primordial density field; or (ii) produced later by the direct interaction of the galaxy with one or more aspects of the environment. Several physical mechanisms have been proposed that could cause the transformation of galaxies such as ram-pressure stripping (where gas in the galaxy is stripped by the "wind" produced by the galaxy's passage through the intra-cluster medium), mergers, galaxy harassment (repeated close, high-velocity encounters with other cluster galaxies), and suffocation (where just the diffuse gas in the outer galaxy halo is stripped, preventing further accretion of gas onto the galaxy). Much attention has also been focussed on galaxy-scale feedback processes, for example quenching of star-formation by extreme feedback from quasar winds which may expel all the cold gas from the galaxy, or via less-extreme "radio feedback" from low-luminosity AGN, which may prevent further cooling of gas. The relative importance of these processes on galaxies may also depend crucially on the mass of the galaxy in question, as AGN feedback should become increasingly effective with galaxy mass as a result of the tight correlation between black hole and bulge masses, while low-mass galaxies with their shallow potential wells should be more susceptible to disruption by environmental processes. To this end we have been looking at how star-formation within galaxies depends on both their local environment and mass, in particular attempting to distinguish between galaxy-scale and external quenching processes, using the spectroscopic data from the SDSS, firstly for galaxies in the vicinity of the A2199 supercluster region, and later for the entire SDSS DR4 dataset. Galaxy mean stellar ages as a function of spatial position in the A2199 supercluster environment, for dwarf (left plot) and giant galaxies (right). In the above plots we have estimated the mean stellar age of each galaxy in the A2199 supercluster based on its spectral indices, and these are shown by symbols of varying colours from blue for galaxies dominated by young stars (age < 3Gyr) to red for galaxies dominated by evolved stellar populations (age > 8 Gyr). The black contours indicate the local luminosity-weighted surface density of supercluster galaxies. We see that in the groups and clusters, both dwarf and giant galaxies have predominately old stellar populations. In the field however, the stellar ages of dwarf and giant galaxies are quite different. Whereas giant galaxies show a complete interspersed mixture of old and young populations in the field, dwarf galaxies in these environments are exclusively dominated by young stars. The fraction of galaxies which are currently passively-evolving (EW[Halpha]<2A) as a function of both luminosity and local environment. In high-density regions corresponding to cluster and group environments, galaxies are predominately passively-evolving independent of luminosity. However in the rarefied field, the fraction of passively-evolving galaxies is a strong function of luminosity, dropping from ~50% for M* galaxies to zero by Mr=-18. The dominant processes that quench star-formation in galaxies depend crucially on their masses. For massive galaxies, the gradual SF- and morphology-density relations which extend well outside the cluster virial radii, and the finding of many passive ellipticals in the isolated field, indicate the star-formation histories and morphologies of massive galaxies are largely defined by their build-up through mergers and the probable consequent feedback from AGN. In contrast the star-formation histories of dwarf galaxies appear completely defined by their local environment, as passive dEs are ONLY found as satellites to massive halos, whether that be a cluster, group or massive galaxy. This implies that internal processes (e.g. merging, AGN/SN feedback, gas exhaustion through star-formation) are unable to shut off star-formation in dwarf galaxies. Instead dwarf galaxies arrive in dense environments still gas-rich and are transformed in-situ by processes such as ram-pressure stripping and harassment, and indeed observationally most star-forming dwarf galaxies in local clusters are currently being transformed. The ultimate consequences of these processes are to transform infalling gas-rich low-mass spirals into passively-evolving dEs, but their immediate effects may well be to induce starbursts. We have found observational evidence for infalling galaxies undergoing starbursts when they encounter the cluster environment for the first time, and are now focussing on understanding what processes may be responsible for triggering these starbursts, and quantifying the importance of triggered starbursts for galaxy evolution within clusters.